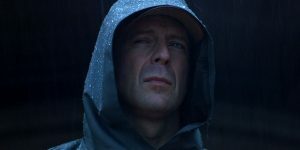 The first entry, “Unbreakable” (2000), for me, is one of the most underrated movies out there and one of my personal favorites in the genre. It’s dark and grounded-in-reality presentation is great and original for this genre at the time. The score is fantastic and a standout of the entire film. The theme song is one of the better film themes out there. It’s highly overlooked and is one many should see if ever given the chance. The surprise follow-up over a decade later, “Split” (2016), is a nice companion to the original. It’s its own central character story. The idea and concepts of a man dealing with multiple personalities is very fascinating. James McAvoy delivers the performance of his career. His character is loaded with possibilities and is scary to watch at some points. 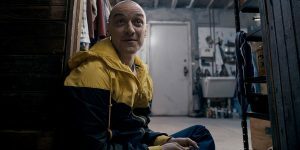 James McAvoy portrays nine different personalities in 2016’s “Split.” Some of the ones he portrayed were a nine-year old, a neat freak and a woman. The storytelling technique of keeping it self-contained, for the most part, was a great direction choice and helped the audience be more invested in the present situation and narrative. 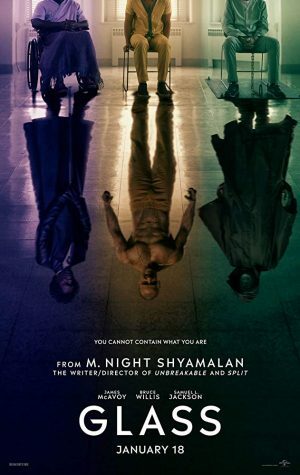 The reason for it being a “surprise” all comes to its twist, which is that this takes place within the same world as “Unbreakable.” It’s one of Shyamalan’s better twists in a while and one of his better films in general. Now, here in 2019, the two worlds collide in the final installment of the saga in the form of “Glass.” The film stars Bruce Willis, Samuel L. Jackson, James McAvoy, Sarah Paulson and Anya Taylor Joy. Shyamalan returns to write and direct the conclusion. So, how was it? Does it shatter expectations? Will there be a split of opinions? Let’s talk about it. 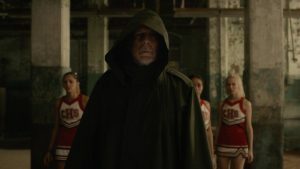 To give you an idea of the story, “Glass” picks up after the conclusion of “Split,” where we find David Dunn, also known as The Overseer (played by Bruce Willis) is in pursuit of another superhuman figure being named The Horde (played by James McAvoy). 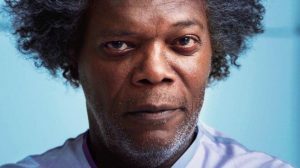 Within all the events unfolding, Elijah Prince, otherwise known as Mr.Glass (played by Samuel L. Jackson), acts as the orchestrator and holds vital secrets critical to both men. Before going in, I was aware of the divisive response this project had received. Some reacted positively and some reacted negatively towards this film. These types of mixed responses can be seen as more notable nowadays in films such as “Star Wars: The Last Jedi,” “It Comes At Night,” “mother!” and more recently with “Vice.” All these pieces were met with very divisive reactions and the same has happened here. McAvoy returns to portray 20 of the 23 personalities. The other three were cut during the editing process. Now after seeing it for myself, I can see two sides of the same coin. There is a lot to enjoy and a lot to be disappointed by. The first positive goes immediately to James McAvoy. McAvoy was the reason to buy a ticket for “Split” and there’s no difference for this film. He delivered a fascinating and layered performance to a misunderstood character in the context of the narrative. Everyone from Willis to Paulson all brought in good performances to their respected characters. The cinematography is vibrant and colorful and the camera techniques, for the most part, worked very well to the film’s benefit. There are lots of long shots that never felt boring or overplayed. Bruce Willis reprises his role as the hero and protector of the story. It has been 19 years since David Dunn has been seen fully on screen. You are on board throughout the beginning and middle of this piece. The movie kept me engaged and invested in what was being presented in the story. However, what ultimately changed my tune and my overall viewing was the last third. Without giving anything away, the last third is too deceiving and confusing. If the film made up its mind as to how to wrap up its narrative, I would have perhaps been fine with it depending on the direction it would have gone. There is no energy or feeling of thrills that the other two carried. What made the other two entries engaging and exciting is their feelings of excitement, thrills and scares at certain points. With this, I didn’t feel that spark or energy anymore. It’s trying to do so but it never hits. Ultimately, the film loses its own identity in trying to be like its predecessors and being something new at the same time. This leads to my biggest issue and is something extremely important in filmmaking. I don’t know fully what the director is trying to say in his piece. It’s not the case that the film requires you to think and discuss. It’s more that it simply was not clear in the presentation. As I said, the last third really makes things in context more complicated than necessary. For lack of a better word, the director’s message is shattered across the screen and the viewer can’t find themselves able to put all the pieces together. Adding more doesn’t equal great sometimes. Adding more just means adding more. “Glass” had its moments to shine and brings lots of solid performances; particularly from McAvoy. But its last third really changes your overall opinion for the better or for the worse. It’s the weakest of the series and ultimately leaves the viewer more confused than satisfied.